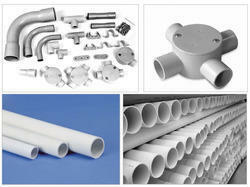 Pioneers in the industry, we offer pvc pipes bend from India. With sincerity and hard work of our adept experts, we have carved a niche for ourselves in this domain by offering PVC Pipe Bend. The offered pipe bends are widely used at several industries, buildings and homes for housing electric wires and cables. Our pipe bends are very smooth at bends and edges to ensure free flow of water. Also, we offer these pipe bends in various sizes as per the requirements of the clients.